We reached the place. Being a health conscious mom and professional I started the inspection of venue and menu. The place impressed me. It was decent place with decent ambience. It was trendy with black and brown color theme. Small wooden tables and black tables for seating. Enthusiastic, charming teenager boy greeted us. Kids were happy to see the modern décor and young crowd. We stood in line. Soon line moved forward and it was our turn. We landed in front of assembly table. It contained red and white sauces compartments. The cheese bins included Parmesan, goat cheese, Gorgonzola and mozzarella. Meat section had all toppings of grilled chicken, meatballs, pepperoni etc. Viola!!! Un-limited vegetable toppings. Leafy greens, roasted red peppers and tomatoes, green peppers, mushrooms, black olives, artichokes, and zucchini. 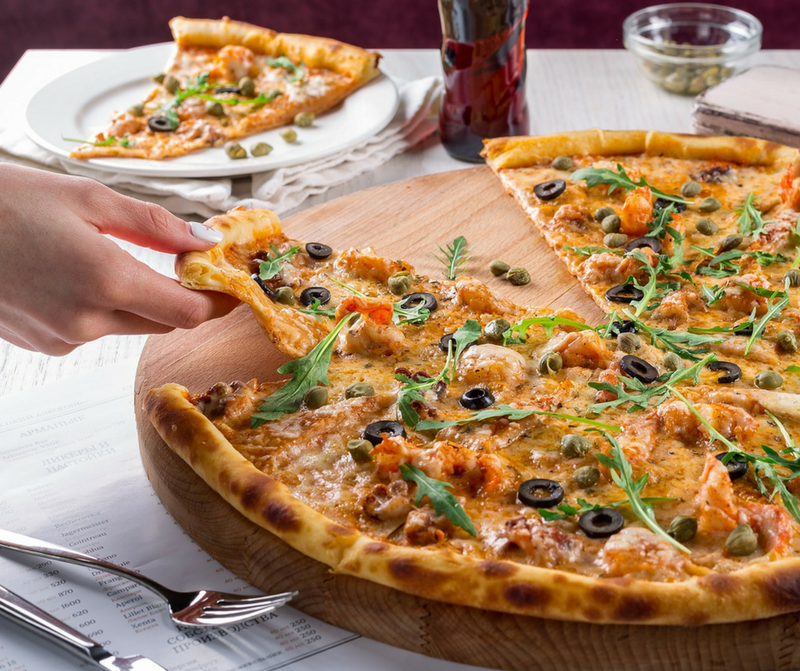 The thin crust slices and many vegetable toppings options help you eat healthy. It doesn’t ruin your diet if you are calorie conscious like me. We placed our order. Our order was processed in front of us. We took our pizza plates and sat on outside seating. It was drizzling and weather felt a bit chilly. The yummy, cheesy, crispy, colorful, warm pizza slice started melting in my mouth. . They serve gluten free and vegan pizza options. They have gluten free crust option, made daily from European non-GMO gluten-free ingredients. They offer a vegan cheese option (soy-free), and none of their vegetable toppings contain any meat, egg or dairy products. For this calorie test, I have selected vegetarian pizza slices. Pizza Hut’s "Vegie lover’s personal pan pizza" is competitive with Blaze pizza. Pizza Hut’s online Nutritional calculator was user friendly. “Dominos Pacific Coast Veggie" is the vegetarian pizza. There is smallest is 10”. Blaze has many possibilities with vegetarian options. You can play with different flavors of sauces and cheeses and mix and match according to your palate. Blaze team is committed to be eco-friendly. Their packaging is made from post-consumer recycled and/or sustainable materials. Forks, knives, cups, straws, lids – even those cute little containers of salad dressing – have are chosen to reduce the waste. Now Remember, these are options for 1 slice of simple vegetable 6” sized pizza. Lets admit we can’t stop on 1 slice… We eat at least 2 slices …right !!! And some might eat more depending on appetite and liking. So you will be consuming twice or thrice of above mentioned nutrients…. As a nutrition expert, I would suggest to have 2 to 3 slices maximum. Choosing healthier food rest of the time. I agree, Life should be fun!!! We should enjoy pizza and donut once in a while…. But everything should be in moderation!!! After all, to be fit and healthy isn’t a punishment….